When I first set out on the Facts About Durban trail, I decided to go into Durban's history in a big way, but not to ignore interesting bits from the present. In that vein, I have a story penned by Chris Hoare for you today. It concerns the Single Buoy Mooring, just off the Bluff, through which 80% of South Africa's crude oil imports are pumped ashore. See the story here. For quite some time I've been meaning to put up a page about ships which have been called Durban. I've finally got around to it and have put it up here where you can see pictures and details of the vessels. I do know of at least one vessel, Ellerman Lines' City of Durban, which does not yet feature on the list but I would welcome hearing of others. A picture of the City of Durban is on its way to me but I know very little about her, except that she may have served in the Royal Navy as the armed merchantman HMS City of Durban. 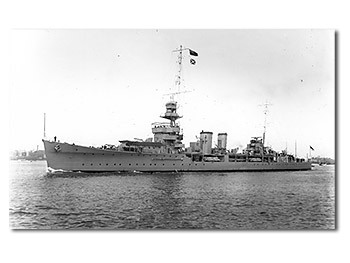 Following on from the last entry in the diary concerning ships which have been called Durban, I have now put up a page where I have written up the details of HMS Durban's Visit to Durban in 1926. I culled the information from a very interesting souvenir booklet which has come my way. Published by the Durban Publicity Association, it provides a fascinating snapshot of Durban at that time. I have received a request from Ingrid van der Burgh for information on Air Guards who served in Durban during WWII and who apparently drilled regularly in Air Force uniforms at Greyville Racecourse after work. Please contact me here if you have any information for us. There is also a page here which has a list of other questions we'd like the answers to. We rather seem to be concentrating on Ships Called Durban at the moment, and I have yet another snippet for you. 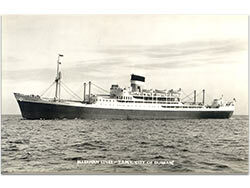 It comes in the form of a wonderful postcard of the Ellerman Lines vessel, City of Durban. Click here, or on the picture, to view that very interesting page. I have received a request from Tessa King for information on the Clairmont Estate in Durban. Please see the Research Requests page for details on that and other research requests. Some months ago in Metrobeat, our ratepayers' magazine, there appeared an excellent article, The Port Captain's Daughter. 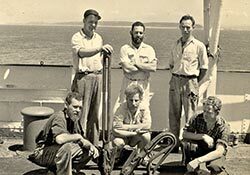 It was about Barbara Bowyer's memories of the 1930s, when her father, Captain William Weller, was Port Captain of Durban. The article provided a fascinating glimpse of the Durban of those bygone days and I decided to try get permission to reprint it on this website. I'm delighted to say that the author, Vivian Atwood, readily gave her permission and I've put the story up here for you to read. Today I've got a snippet from Rosemary Dixon-Smith for you. It's a clipping from the Natal Witness of 26 June 1880 reporting the arrival of the Union Royal Mail Steamer Durban at Cape Town. The clipping lists the passengers on their way to Natal and several bits of world news which the Durbanites of the day would have found most informative. Click here or on the image, left, to view the page where I've posted the clipping and details of ships which have been called Durban. 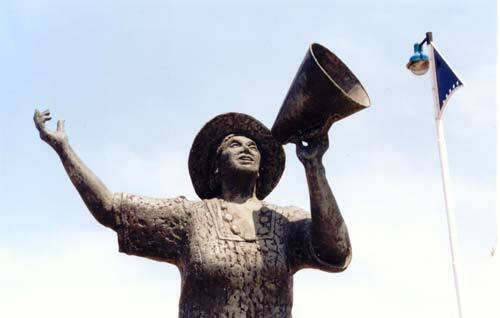 I've been busy putting up a page on Currie's Memorial Fountain and the Da Gama Clock. The Scots were the masters of decorative ironwork in the 19th century and these are fine examples of that craft. What made them even more interesting to me was when I discovered that they are made up of separate pieces and that buyers could mix and match until they got a decorative piece which suited their taste and budget. A number of people then wrote in to tell of monuments and fountains in other places which had components in common with ours. Some of this has been mentioned in the diary before but I have now moved all of that to its own page, and added some new information that has recently come my way. I don't think I've been offline for this long ever since I started this diary more than two years ago. I've been quite hard-pressed, what with having to earn a living and other things. At least I've still been collecting stuff even if I haven't put it up. Today I've got a very interesting article for you which was contributed by Gerald Buttigieg and concerns the things that Durban youth did to entertain themselves in the late 1950s and 1960s. I personally ejoyed the article very much and I'm sure you will too. Read it here. Two days ago, I once again visited Margaret Surmon, the widow of Les Surmon who was joint MD of the Union Whaling Company when it ceased operations in Durban, and her daughter Caroline. While paging through Margaret's whaling memorabilia, I came across a clipping and partially ruined photograph concerning the whale spotting flights which were flown for many years from Durban. By a strange coincidence, the clipping was published in the Daily News fifty years ago this week. I have updated the whaling page, here, with the two pictures. Today I've got a book review for you. 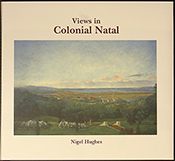 It's Views in Colonial Natal by Nigel Hughes and is a catalogue of the paintings done in Southern Africa by Cathcart William Methven. Methven was a multi-talented individual who not only did a stint as Durban's Harbour Engineer, but was also involved in the acquisition of Durban's Town Hall organ, and was the pre-eminent landscape artist in Durban at the time. Read the review here. Regular visitors to these pages will know that I have a burgeoning collection of ships and planes which have been called Durban. I have recently discovered that there was even a shipping line called Durban Lines. I managed to obtain two colour slides of the Durban Lines vessel Berea alongside in Lourenco Marques (now Maputo). Check out my Ships Called Durban page here. I'm sure you'll be curious to know how many people visit this site in addition to yourself. Just click the picture on the right and you can see the graph I've prepared for you. The purple bars represent the number of unique visits every month and the brown bars are the number of pages viewed by the visitors. 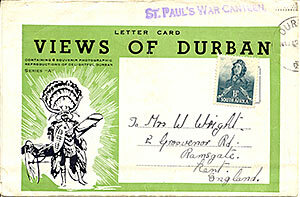 I have also started a page of Durban postcards which I'll be adding to occasionally. Click here, or on the picture below, to check out the first card and for details on who posted it. Over the last while I've been amassing a considerable amount of information on ships that have been called Durban. I'm grateful to Robert Davies for adding to my stock of information on ships which have been called City of Durban. I've added the info to the SCD page here. 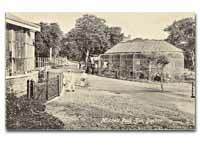 I've also put up a vintage postcard of Mitchell Park on my postcards page here. Sometime ago I spent a very interesting morning with Terry Tribe who was a blacksmith with the Union Whaling Company. He worked in Durban but also went a number of times to the Antarctic for the summer whaling season aboard the factory ship Abraham Larsen. My meeting with Terry was a shamefully long time ago, but I've only just got round to putting up a page of his experiences. Check it out here. I have had an article on Flying Boats in Durban published in the edition of our ratepayers' magazine Metrobeat. 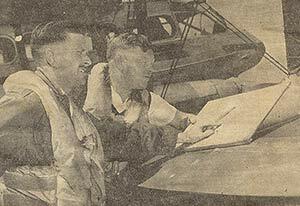 The story was made up from material on my flying boat pages here and there has been a terrific response from people with additional information to offer on this wonderful chapter in Durban's history. 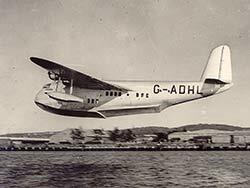 I have now spoken to people who travelled on the flying boats, people who worked on them, one person who sold tickets for them, a person related to the Short Brothers who made most of them and, in the near future, I have every hope that I will be able able to interview one of the pilots. The process of getting in touch with everyone who who phoned was complicated by the fact that I accidentally gave Kevan Mardon's telephone number in the article. He has valiantly been taking messages and I am in the process of speaking to everyone to who phoned, and going to see a lot of them. The information that I get will be put up on the site as soon as I can.